Let’s be honest here: the BMW M4 (and its M3 sedan sibling) is still the benchmark high-performance luxury coupe. Yes, the Mercedes-AMG C63 S brings a hell of a loud bark to the battle but at the end of the day, it also falls a bit short of its Munich rival. And then there’s the 2017 Cadillac ATS-V Coupe, the subject of today’s unboxing review. Powered by a twin-turbo 3.6-liter V6 with 464 hp and 445 lb-ft of torque, the 2017 ATS-V is also a Nurburgring-tuned track toy that’s at home on twisty and potentially life taking pavement as well as luxurious cruising. You know, just like the M4. But Cadillac (and Mercedes-AMG, for that matter) has been gunning after the M3/M4 for years now and the American luxury brand has no doubt put the Germans on notice. In a relatively short period of time, Cadillac has proven that it too has a team of driving engineers who are just as nuts about shaving every possible tenths of a second off track times as their German counterparts. Things like that matter in this segment. But here’s the thing about the ATS-V Coupe that could be the deciding factor for us: it’s cheaper than the M4 and C63 S. By several thousand. Really, those tenths of a second and lack of a more premium interior don’t matter that much. Or do they? Special thanks to Woodland Motors for letting us film the car. 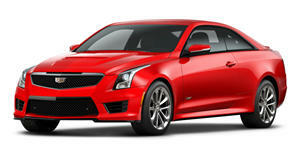 Despite a few quirks, the ATS-V is a wonderful sports car.